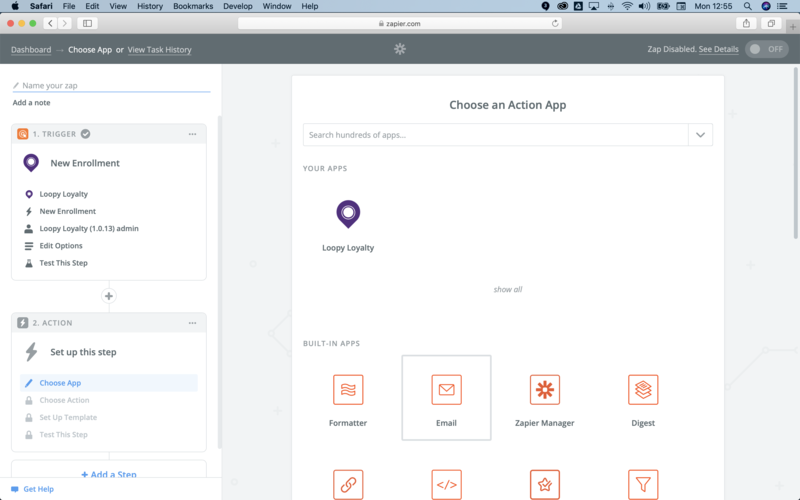 1 - Login to Zapier and click on the button 'Make a Zap!'. You are first going to set up the trigger (i.e. 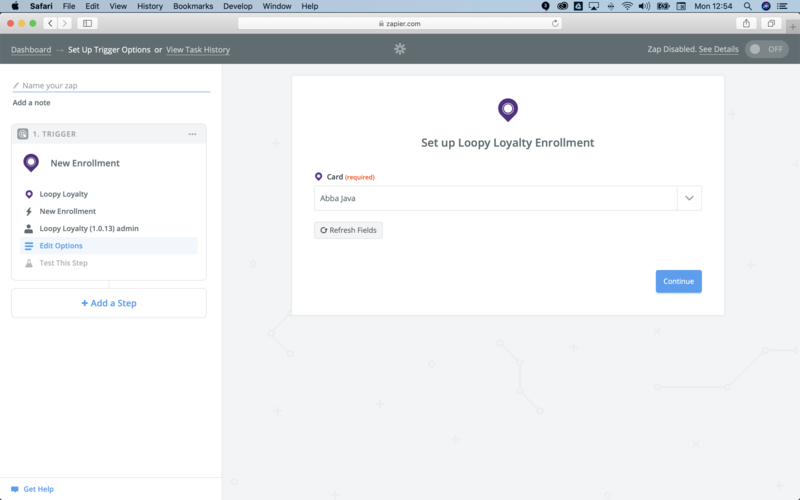 someone enrolling in your loyalty program). 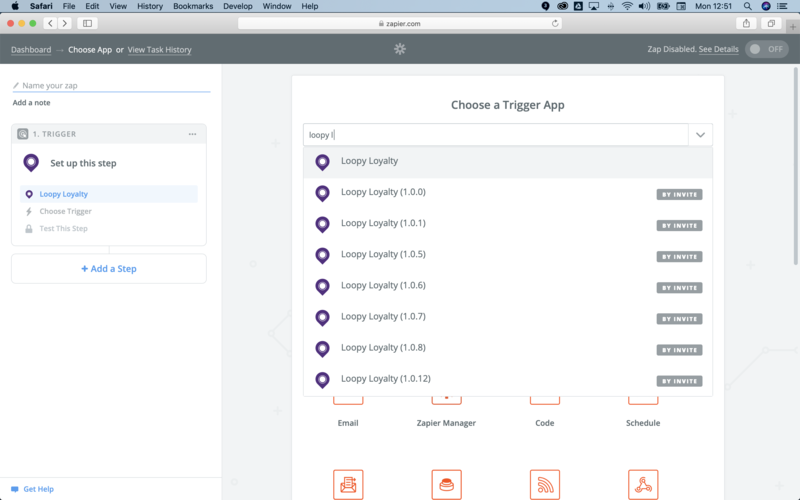 2 - When asked to Choose a Trigger App, type Loopy Loyalty and select the first one. 3 - Choose 'New Enrolment' from the radio buttons, and then click 'Save + Continue'. 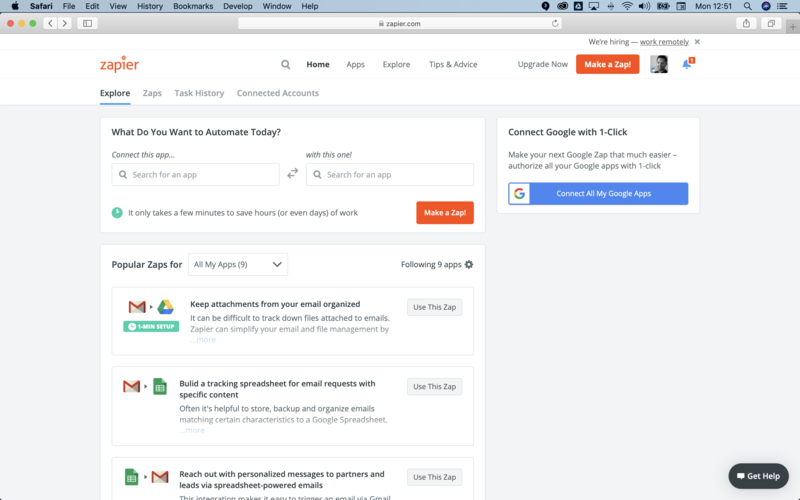 4 - Click on 'Connect an Account'. 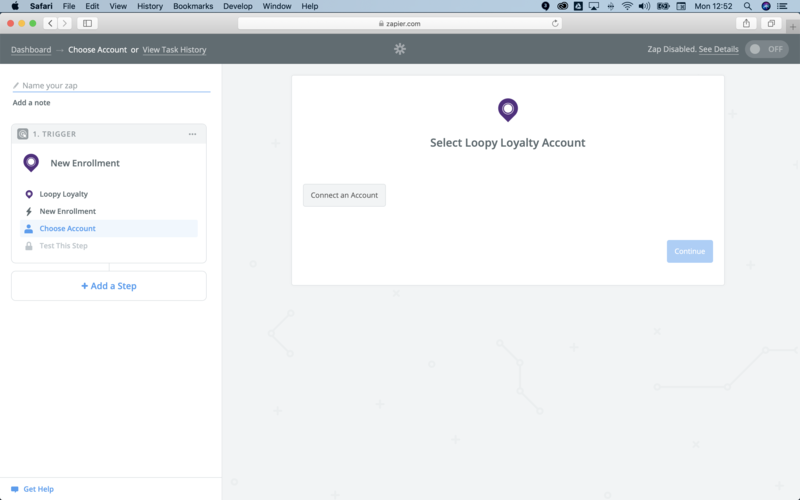 5 - Enter your Loopy Loyalty credentials and then click 'Yes Continue'. 6 - To check your Loopy Loyalty account is connected click the 'Test' button. 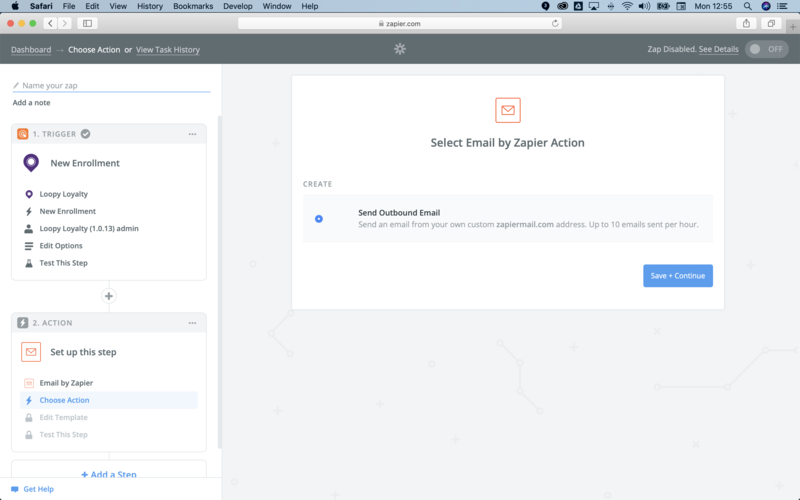 7 - Confirm that your see a 'Success' message and click 'Save + Continue'. 8 - Choose the Card that you want to receive an email for when someone enrols, and click 'Continue'. 9 - You will be shown the Enrollment page and now click 'Continue'. 10 - Now it's time to set up the action. Click on the blue text to add the action step. 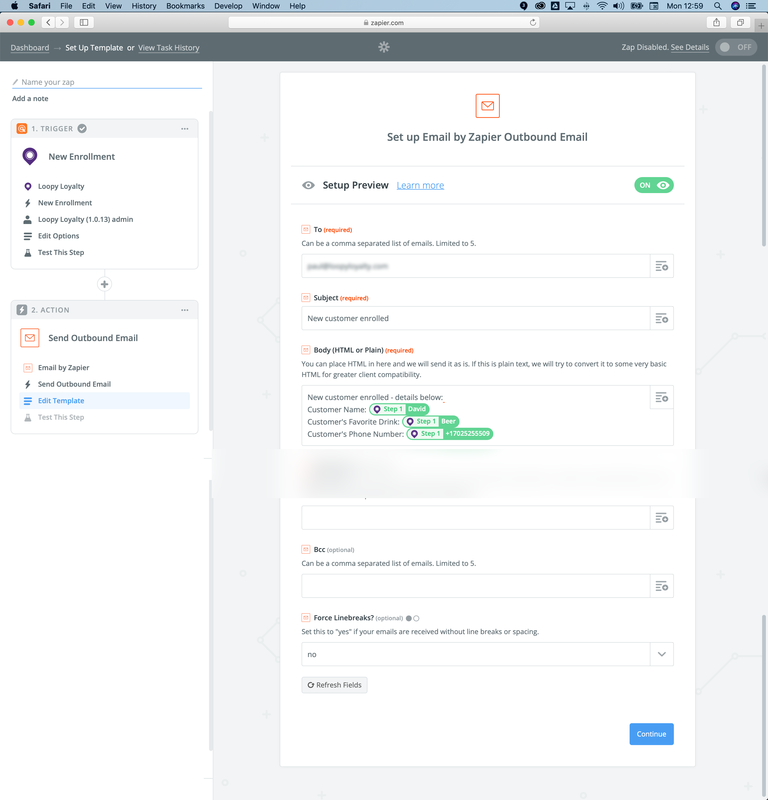 11 - Select 'Email' from the Built-In-Apps shown. 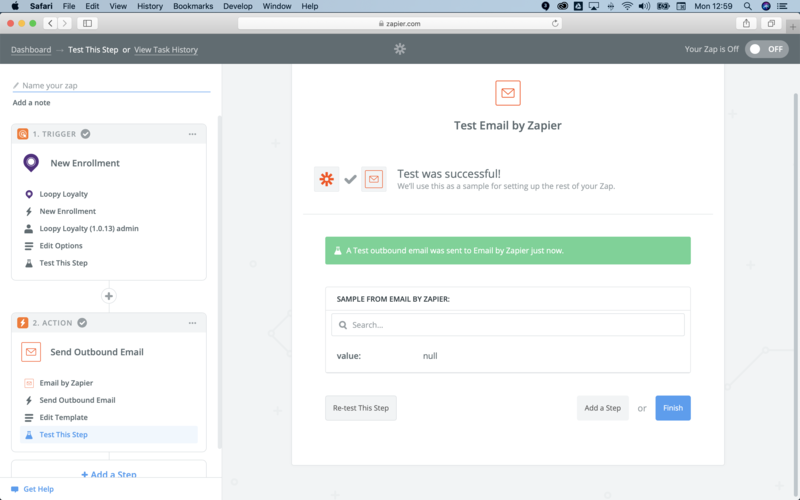 14 - Check the information and click 'Send Test to Email by Zapier'. 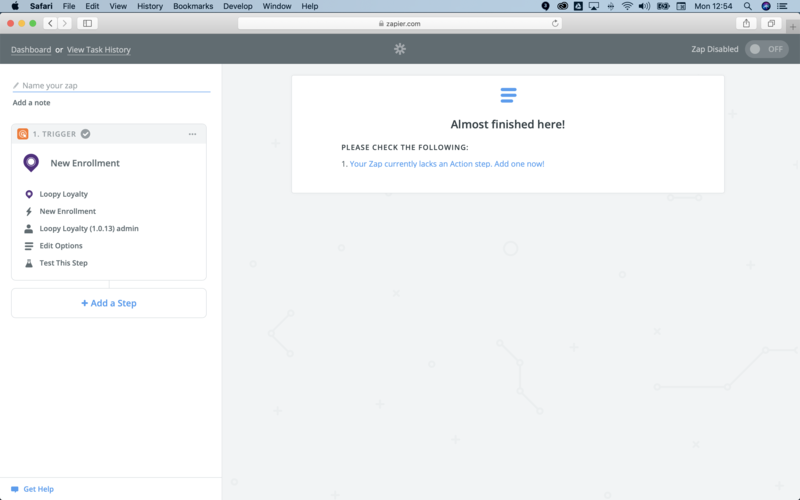 15 - Check for success and click 'Finish'. 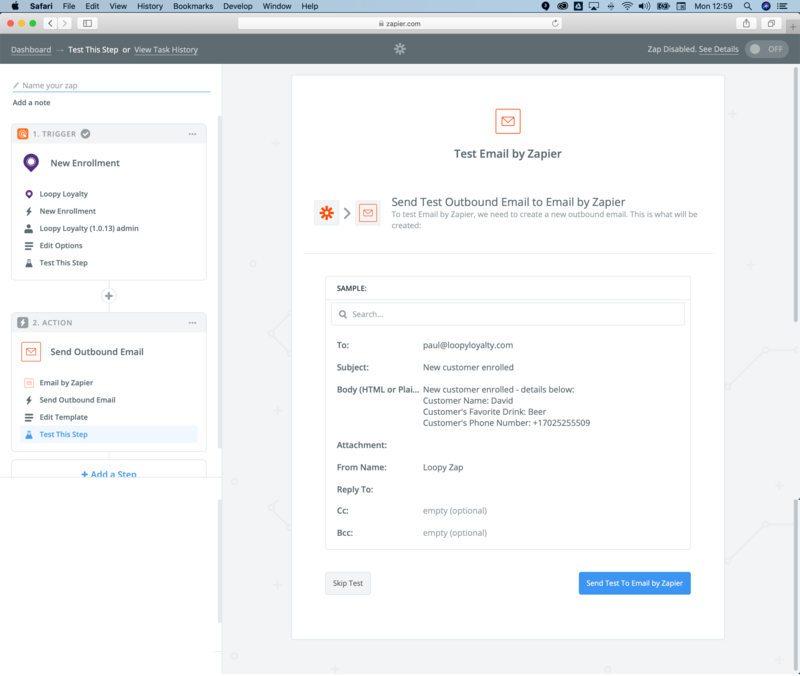 You can also check your inbox to see you received the test email. 16. 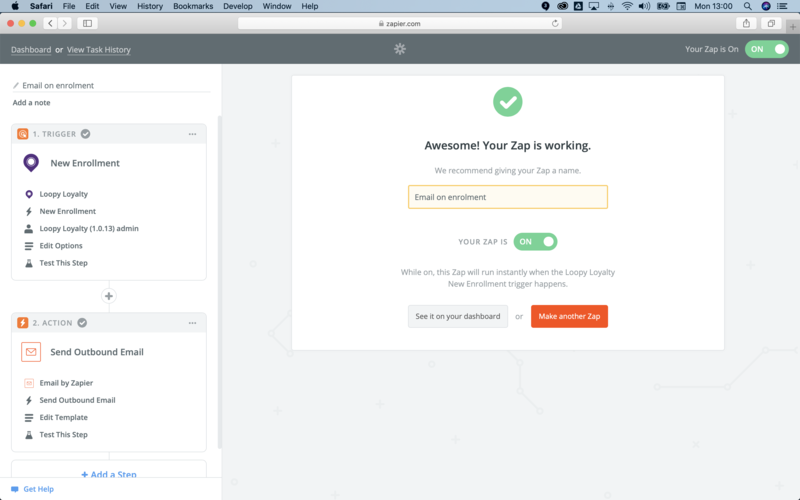 Name your Zap and make sure the Zap is turned on. 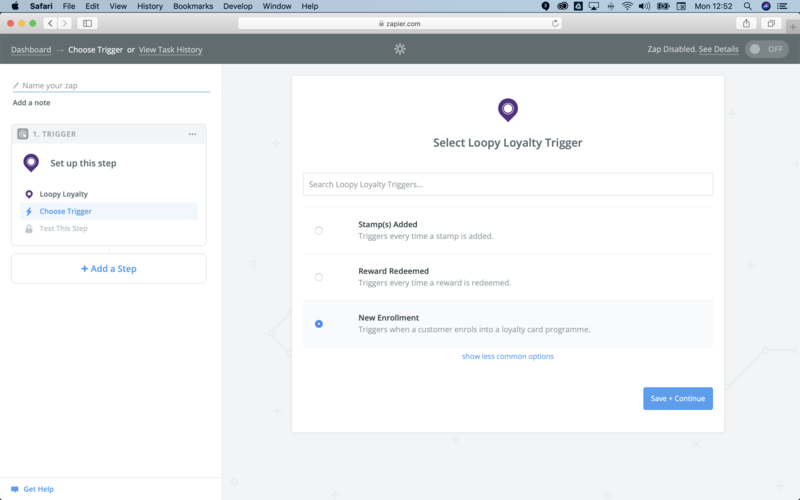 Now every time someone enrols to your Loyalty program you'll receive an email. 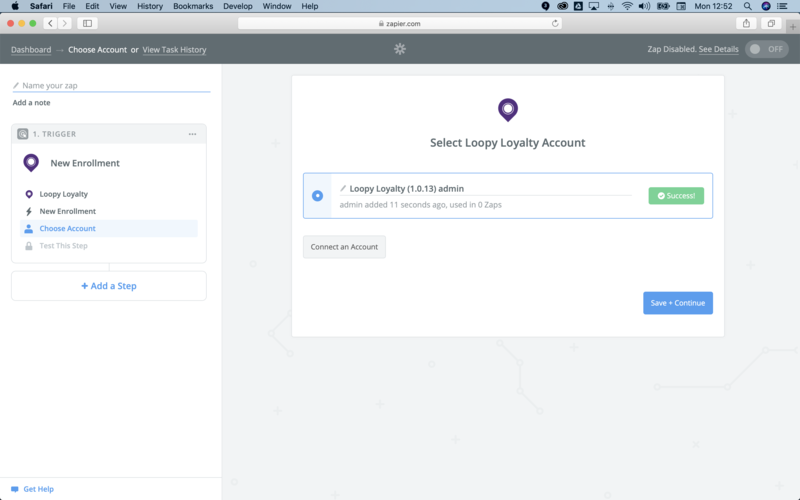 We recommend signing yourself up to your loyalty program and checking that you receive an email. 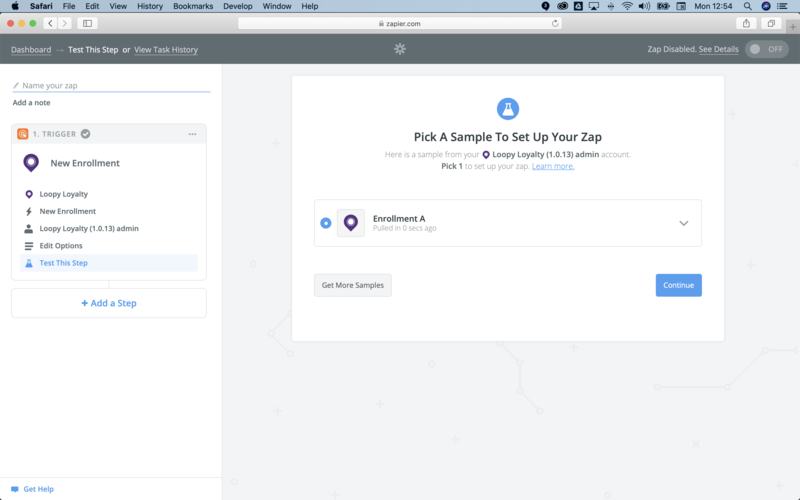 If you need to make any changes to the Zap, navigate to the 'Zaps' tab from your dashboard, click on the down arrow on the Zap and choose Edit. Was this helpful? Please let us know if you have any questions! 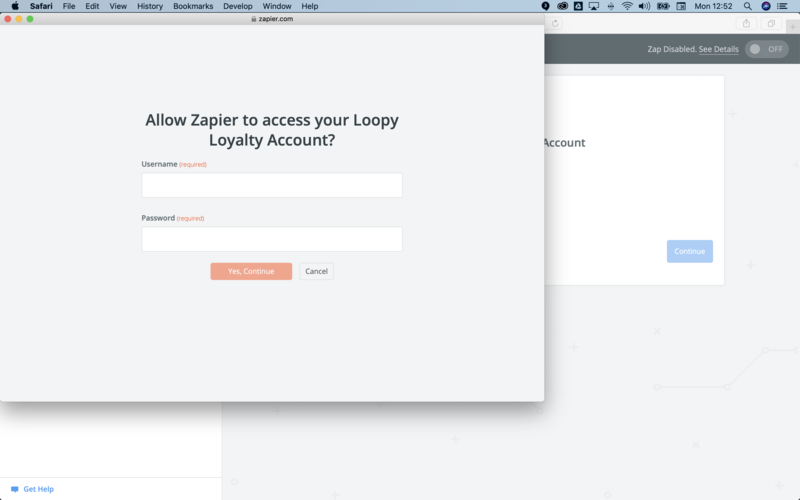 Please note that Zapier is not owned or managed by Loopy Loyalty. 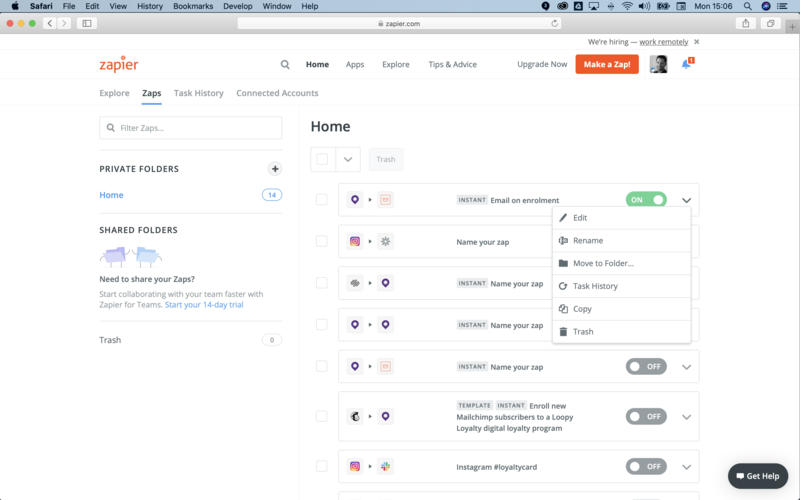 If you require more support, or specific advice, on how to use Zapier, we recommend you get in touch directly with Zapier.